Formulated with superior ingredients such as skin brighteners, antioxidants, and enzymes, DermaQuest Peels are a great way for us non-celebrities to get that perfect glowing skin we envy on the silver screen. And at the cost of what you’d typically pay for a professional cut and color, it’s affordable to boot. Getting a Dermaquest peel once a month can not only improve the skin’s appearance. These ultra-effective treatments are great for treating mild skin conditions such as acne and melasma. Peels are a powerful, flexible addition to your beauty regime, whether you want to cleanse deeply or effectively treat everything from fine lines to acne. Read further to find out more about DermaQuest Peels and why they are the beauty industry’s first choice when it comes to skincare essentials. What is a DermaQuest Peel and how does it work? After preparing and protecting delicate areas such as around your eyes, your peel specialist will gently apply the peel solution to the skin. Don’t worry if you feel a little tingly. This is just the active ingredients getting to work. After the treatment, your specialist will cleanse away the peel using a formulated neutralising solution, followed by a moisturizer to soothe and protect the treated area. Your specialist may also recommend an aftercare routine that includes cleanser, advanced B5, anti-oxidants, and SPF. Following your treatment, your first layer of skin will dry out and eventually peel off. This is normal, and depending on which treatment you receive, the process may take anywhere from a few hours to a few days. The new skin that is revealed is usually smoother and less wrinkled than the old skin. DermaQuest Peels treat any number of conditions including fine lines, wrinkles, sun damage, age spots, mild scars, certain types of acne, freckles, and melasma. They also are ideal for general improvement of the look and feel of the skin. You may have a DermaQuest peel applied to the face, neck or hands. If you’re like 99% of the population, you may be a little bit scared to try a peel. While the word “peel” may bring to mind images of raw, red, painful skin. Think again! A Dermaquest Peel is actually quite gentle on the skin and there is no down time with any of our peels. Many customers say they really enjoy their peels, and describe the process as ‘a bit like an intense facial’. Whilst the solution gets to work, you might feel tingling and your face will get warm, but it’s not uncomfortable. 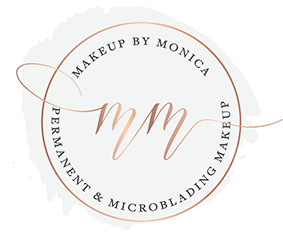 What kind of peels does Makeup by Monica offer? We offer a range of peels specially formulated to boost radiance, hydration and improve the overall tone and texture of your skin. Call ahead to find out which peels are available in our salon, and to request an appointment. It’s best to have a chat with your practitioner about what will suit your skin best. Keep in mind that peels can be combined to target different problems simultaneously for beautifully radiant results! Ready to take the plunge? Call me today to discuss which peel is right for your skin type and what kind of results you can expect. ← Have you Heard of My-Lipo?